PARIS – One thing leads to another and somehow things don’t lead to as many things as before…ok, start again. I finally, over the last week, had time to attend a few open mics – and a musical evening – that I have wanted for a very, very long time to attend. And I was wonderfully surprised, enlightened and inspired by them all – basically! The first was Stephen Saxo’s open mic at the Cross of St. George pub on rue St. Georges, not far from Pigalle, called Finely Tuned Sundays. It was the first time I had played with Stephen for a long time, the last time being at his open mic – now defunct – in St. Germain en Laye. The story of this new one is kind of funny: I had noticed for a couple of months that there was an open mic on Sunday nights early, through dinner time, from about 6 pm to 9 pm, and it was not so far from chez moi. I kept on intending to go, but those hours never worked out for me. Then, one week all of a sudden, my friend Stephen the sax player, ie, Stephen Saxo, announced on Facebook that he was hosting this open mic at the Cross of St. George. He had not been the host when I discovered it, and it turns out, from what I understand, that it was not really very active. So Stephen took over and …boom! Yes, it was a good evening, and in the end a nice time of the day to have an open mic, because you can play music early, then eat your dinner either at the pub or wherever else you might choose. Stephen accompanies those who like that, but otherwise, it’s a classic open mic, where you can go up and do your stuff. The pub had quite a large crowd, but most of them looked like regulars, for whom the music was not the main attraction, but something they appreciated nevertheless. The following night, Monday, I was ready, willing and able to finally go to Sheldon Forrest’s lates open mic, at a pub nestled in not far from Montmartre, on the other side of the hill…. I have written about Sheldon’s various open mics and vocal jam sessions over the years, starting with where we met, at the now defunct Swan Bar in Montparnasse and most recently with his Ozmos Café open mic, also near Montparnasse. But I had been itching to go to this Cave Café open mic and jam for a while, since I had the impression that it was a little different than the others where Sheldon officiates, playing his piano accompanying singers, often with a jazz or cabaret leaning. It turned out to be different, entirely different, except for Sheldon’s always genial hosting. The Cave Café is a corner bar owned by an American who is so discreet you wouldn’t know he was anything but a local French bar owner. The open mic takes place in the cave of the café, as you might expect by the name of the joint. The cafe is a classic Paris vaulted cellar, and this one is complete with a bar and a nice little stage. The vibe is 100 percent open jam, music-loving, anything goes. There’s a piano on the stage as well, but Sheldon only plays according to when it is appropriate. You can do solo guitar and vocals, or you can be joined by other musicians – I did both. I enjoyed being accompanied by a lead guitarist, Sheldon on piano, aand even an acoustic guitarist and harmonica player. The sound constantly being tweaked by the barman/soundman, using his iPad to control the sound. It was a fabulous night, and I look forward to many more. The one thing that really stands out is that it’s a music-loving joint that attracts musicians of all kinds. It has been many months also that I have been intending to attend the open mic and jam of Olivier Domengie, the Carré open mic and jam in the heart of the Latin Quarter. I know Olivier from his various other open mics and jams, notably the one that used to be at the Paradis bar near Barbès, the Nul Part Ailleurs bar near the Bastille, and the Carré jam that happened in the bar near St. Michel. Later in the evening I not only had it confirmed by Olivier that it was the very same street, but also that 1) Gainsbourg’s home was just around the corner, and 2) Gainsbourg used to go sometimes to play and hang out at this bar! The bar is part of the Don Camille, which is upstairs, and its walls are plastered with the photos of famous popular musicians. The jam is a classic Olivier jam, and I took the opportunity to play here with a drummer, sax player, bassist, and lead guitar. I had not brought my own guitar, but I got to use the nylon string semi-electric of Olivier – which dictated a little the songs I had to do (“Wicked Game,” “Mad World” and “Don’t Back Down”). The feel of this bar, with its broken mirror walls, is really 1970s, 1980s, nightclub, but with the stage perched in the front window, and the comfortable chairs and couches, and the large number of musicians present, I cannot recommend it enough. And then there is the need to do the little visit around the corner to the home of Gainsbourg, with its famous graffiti covered walls. I took a photo or five of that. This whole week began, by the way, with a visit to the cultural pub of the Bois-Colombe suburb, where it turned out a pianist singer from my own suburb right next store was giving a concert in this small, convivial bar. Such cool places are rare in the suburbs, but the Captain Fox, as it is called, gets the recipe right! And this performer, as you can see from the video I have put up, is fabulous – anyone who can sing this Queen number as well as him is exceptional. And that ends the roundup of my open mics and jams and spectator-hood evenings of the last week. I added Sheldon Forrest’s Osmoz Café open mic in Montparnasse, I added the new Paris Songwriters Club open mic at the Tennessee Bar (run by Paddy Sherlock) and I added the Paris Spoken Word night at the Chat Noir, which I was surprised to discover I had not put on the list, since I had already performed there years ago! PARIS – I just finished a day of work at the office, and I find myself having to rush off for a meal before another, early-starting open mic tonight. That means I have no time whatsoever to do a blog item about the absolutely wonderful open mic I attended last night. But because it was so absolutely wonderful, I desperately want to write about it here – i.e., just mark it down in this blog, mark my territory, place it in the page before time takes over with another few adventures…. So with that in mind, and feeling desperate about being late for my dinner rendezvous and not being able to write anything that will live up to the great atmosphere of last night’s open mic, it suddenly occurred to me that, hey, how long does it really take to write a blog item just to get SOMETHING down on paper!?! (On the screen, not paper….) So then I thought of a challenge: Give myself a limit of three minutes and that’s the end of it! It doesn’t cost much in the grand scheme of things, maybe not even the metro I have to catch! OK, but here we are now and I realize that it has taken me three minutes to write the above two paragraphs and I am losing my own self-imposed challenge! So I have to conclude this now before a fourth minute passes. IE, the open mic in question was the Wednesday night vocal jam session of the Swan Bar in Montparnasse, and despite it having a theme of jazz standards, it is entirely open to just about every kind of music, as you will see from the few videos I managed to take (and upload earlier in the day). This is a very fun open mic of a different format, and much of the fun is thanks to the incredibly wonderful hosting of Sheldon Forrest, the pianist MC, organizer of the open mic who plays along with singers who do not otherwise play an instrument. Bring your sheet music and play with Sheldon, and now a sax or clarinet man and bassist. Or if you have a guitar or for that matter a harp, you can go and play that! Anyway, I have now failed because that fourth minute has come and gone and I MUST go! Bear with me if you read through all this crap that I have laid down on the screen in the last four minutes and a bit more. Hugely mixed emotions yesterday night as I had a couple of literary evenings mixed with music to attend. The first was not mixed with music, in fact, but was the most bittersweet. That was a visit to The Village Voice Bookshop, for a party to “celebrate” the closure of this Paris institution of the last 30 years. The store is closing as it can no longer survive as an independent bookshop in our Internet and ebook world. The second event was a celebration of Bloomsday, at the Swan Bar, where I was invited to play music and to listen to readings of James Joyce prose and other Irish things. The Village Voice was one of my first Paris hangouts, and I went there in the second year of its existence, starting in 1983. I had seen many readings there, met many people, and got to know Odile Hellier, the woman who started the shop and has run it all these years. 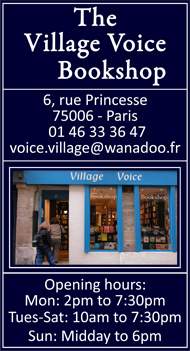 She is a fascinating woman who loves American literature, and decided to open a store with the true feel of the American literary expat bookshop in Paris – I guess she is a mixture of both Sylvia Beach AND Adrienne Monnier, who ran their stores only a few blocks away a few decades ago…. When I arrived for the closing celebration, I found that not even my personal invitation to the thing would save me from the impossibility of getting through the doors, so full was the two-floor shop of admirers and book lovers. In fact, they were bursting out into the street. All I could manage to do was glimpse inside and see Odile reading something from the staircase to the throngs below. I made a video of this, to give an idea. I went off and ate a wonderful pizza dinner at a nearby pizzeria, where I also devoured the London Review of Books that I had bought in Montreal last week. Then I returned, sweating from that hot and spicy pizza, and found that I could now penetrate into the Village Voice. There I found the place now had enough room available for a visitor to wander around, and meet old friends. I started by saying hello to Odile outside the shop, where she was talking with someone and no doubt getting some fresh air after her various readings. Inside, I found some old friends, including Jim Haynes, the American Paris expat supreme, whom, I recalled, I had met for the first time at the Village Voice in the back room cafe it used to have, in 1984, while I was reading Jim’s very own autobiography, “Thanks For Coming.” Jim and I kept contact over the years, I have been to his famous Sunday dinners at his atelier in the 15th arrondissement, and our lives have criss-crossed occasionally. I also saw David Applefield, whom I had met at Shakespeare and Company in 1983 in the writer’s room, but whom I had probably seen more often in those early days at the Village Voice. David, at the time I met him, was working on the first Paris issue of his literary review called “Frank,” which would go on to have many more issues and a long life in Paris. Last night he passed on to me a book he has just published, right off the press, in a new imprint, and which was written by another Paris literary alumnus, John Strand. Strand had started another Paris literary review in the early 1980s, called Exile, or Paris Exile, can’t remember quite. But I do remember him celebrating one of the issues at some kind of evening at the Village Voice in the early 1980s. Strand has gone on to become a multiple prize-winning playwright based in Washington D.C., and his novel is called, “Commieland.” I’m looking forward to reading it, and seeing where Applefield’s imprint, called, Kiwai Media, goes. Unfortunately, I could stay long at the Village Voice as I had agreed so sing Irish songs at the Bloomsday evening at the Swan Bar, a newer American-culture hangout in Paris. In a brisk walk from the rue Princesse to Montparnasse, I managed to digest that pepperoni pizza and all the desert items – macarons – that I ate at the Village Voice. I arrived to find Sheldon Forrest hard at work accompanying a singer, and the Swan Bar was just brimming full of people. This bode well, and as I waited to perform my first song, it occurred to me that I had a nice little story to tell about James Joyce, and I could connect it to the build up of my song. It was a story about how the journalist and novelist Eugene Jolas had spoken to Joyce one day and asked him what he accomplished that day, and Joyce responded that he had worked all day and managed to complete a sentence. “Only one sentence??!! !” “Well, yes,” said Joyce. “I knew what the seven words were, but I could not figure out what order I wanted to put them in.” I then told the audience that I had several songs, but did not know what order to sing them in. The one that went down the best, and which I did sing the best, was “Only Our Rivers Run Free,” by Mickey MacConnell. There were lots of other musicians, lots of readers, and the evening was in general a bigger success – I felt – than last year’s such celebration at the Swan Bar. I returned home, had a good sleep, got up today and finally, finally, after nearly four years finished the book I have been working on about my first year of musical adventures around the world. I also came up with a new, final, working title: “OUT OF A JAM: An Around-the-World Story of Healing and Rebirth through Music” In the end, I must say, that it felt appropriate to complete the book on such a literary weekend…. The announcement on Facebook immediately caught my attention: The Swan Bar was holding an exceptional jam session on Friday from 9:30 PM to 1:00 AM. 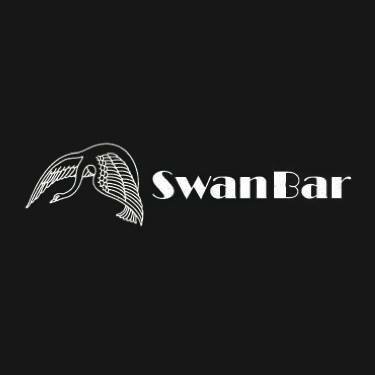 The Swan Bar is an American owned a run NYC-style jazz bar in Montparnasse, and it usually has fixed acts on Friday nights followed by an open stage from 11:30 to 1 or so. So this was an exceptional jam, and announced as such by the music master MC and pianist extraordinaire, Sheldon Forrest. That meant I had to go. Of course, ever since my first visit to the Swan Bar a couple of years ago I have always felt that it was not really a place for a sort of rocky, folky, singer songwriterly type like me. But since every single time I go I am accepted with open arms – as are all other musicians of disparate styles – I end up going, and end up pleased and proud. Last night was no exception. Sheldon accompanied all sorts of singers in songs of traditional jazz, broadway show type songs, right up to the pop stuff I do, like Canelle De Balasy the barwoman’s rendition of Bob Dylan. And then the stage was mine twice, alone with my guitar. I did one of my own songs, and three cover songs, in two visits to the stage. It was very far away from the jazz standards that made up the bulk of the music, but as usual, provided a break and a change. A wonderful evening, on the whole, and let’s hope they do more….